The phenomenon of “ratings bunching” – a range of wines which vary widely in terms of style and price receiving the same score – has been pointed out by various users of this site recently and I stand guilty as charged – the overall standard of winemaking is now so high that there is very little to differentiate the vast majority of wines in purely technical terms any more. The problem is exacerbated in that it has been general policy to publish reviews only of wines that have at least some inherent merit – to guide users to what they might want to drink rather than make too much of what they should avoid. There are supposedly over 8 000 current-release local wines on the market and getting featured on this site at all is surely some kind of achievement. That said, I increasingly accept the argument that not posting reviews of “lesser” wines leaves users of this site with no means of calibrating. What, for instance, would I make of The Winemasters Cabernet Sauvignon 2017 from Nederburg? Nederburg now falls under Libertas Vineyards and Estate, the new stand-alone company created by producer-wholesaler Distell to oversee premium wines brands and there are a number of examples of single-variety Cabernet Sauvignon from this cellar – the Two Centuries 2014 (R450 a bottle) rated 5 Stars and was Red Wine of the Year in Platter’s 2018 while The Manor House 2015 (R175 a bottle) rated 95 on the 100-point quality scale and was the best wine overall in last year’s Prescient Cabernet Sauvignon Report. Selling for between R100 and R120 a bottle depending on which retail outlet you choose, the Winemasters is not quite entry-level (that would be the 56Hundred with an approximate retail price of R65 a bottle) but is probably intended more for every day rather than special occasion drinking. According to the online fact sheet available via Wine.co.za, grapes were sourced from around the Western Cape, maturation in wood lasting 8 to 10 months. Alcohol is 14.55%, residual sugar 4g/l, pH 3.69 and total acidity 5.94g/l. The nose is extraordinarily primary with lots of berry fruit plus the merest herbal whiff while the palate is juicy and soft. Technically sound as you’d expect from the biggest producer in the country, fun and easy to drink, but lacking in complexity and length, I rated this 86/100. 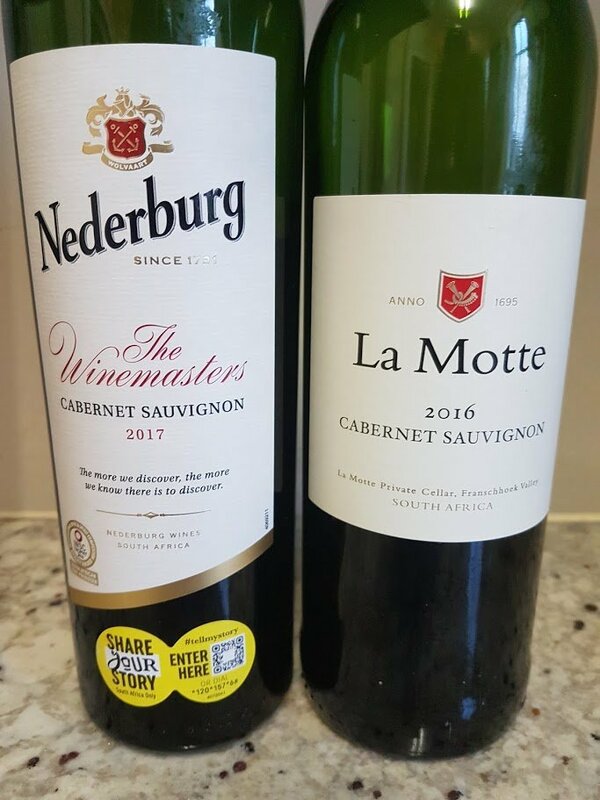 La Motte in Franschhoek, owned by Hanneli Rupert-Koegelenberg and run by the savvy Hein Koegelenberg, is best known for its Syrah and Pierneef Syrah-Viognier, but also has a commercially successful Cabernet Sauvignon, the current-release 2016 priced at R135 a bottle. Grapes for this originate from Stellenbosch (50%), Franschhoek (30%) and Bot River (20%) and maturation lasted 16 months in French oak, 33% new. Alcohol is 13.5%, residual sugar 3g/l, pH 3.58 and total acidity 5.8g/l. Total production: 108 000 bottles. The nose shows rose geranium and red currant while the palate is sweet-fruited with zippy acidity and soft tannins. Clean and correct but again an easy style. Rating: 87/100. Oh, that there was more to separate the average from the good but that’s simply not the case when it comes to wine. It is well documented that the purchasing decision is influenced by extrinsic factors such as price, variety, branding (including packaging) and distribution and consumers should always bear this in mind – if you’re looking for competitively priced, utterly reliable, widely available Cab then the likes of Nederburg The Winemasters and La Motte will serve you well enough. If, however, you are seeking something a little more soul-stirring and a little more exclusive and are prepared to pay for it, then this site can probably help you. Previous articleGreg Sherwood MW: South African Wine in the UK – Does Turnover Match the Hype? Hi Christian – were these scores you arrived at tasting both wines blind? Hi Michael, I think the broader issue is that many consumers presume that “commodity wine” should rate radically lower than “fine wine” but there is ultimately no real reason why a cellar of high technical competence such as Nederburg or La Motte shouldn’t be able to make generally pleasing wines at all price points. That Winemasters 2017 with its oodles of fruit and 4g/l of residual sugar is difficult to hate. So not much of a gap between average and good, as I say. What differentiates the good from the great, however, are more metaphysical considerations such as terroir and singularity of winemaking vision. Well I don’t feel like the philosophical position of this site needs to be defended in any way, this little bit of insight is greatly appreciated. Is there not perhaps room for a section of the site devoted purely to “fine value” (in the strictest sense, I guess this would look like a asymptotic relationship between price and cost). So a wine that scores 87/100 at R70 per bottle may be worthy of a mention. As I say, i appreciate that this site is all about “fine wine” (whatever that night mean), but even lovers of “fine wine” would appreciate a subtle nod in the direction of some “fine value”. Under these conditions, one might feel that an 87pt wine had earned a spot on the site. The two stoned birds in this instance would be (1) proof of life lower down the 100pt scale, and (2) a sustained commitment to “fine”, or at least clever winemaking that manages to deliver more points per rand than their peers. Totally agree, with the caveat that when it comes to everyday wine, some abstract metric of quality is less important than personal taste. Given two 86-point cabs, I’m likely to choose the one with the flavour profile I prefer, even if the other may be slightly more technically proficient. Perhaps even more so with whites: there are a number of well-made and delicious chenins at R70 – R100. I don’t really need anyone to tell me how to appreciate their nuances, I just need to taste a bunch and see which are most immediately pleasing. That said, a shortlist of good value wines could be useful. The Wine Magazine in the past used to have a page of good value recommended wines. While I agree that the focus should be on fine wine, the affordability of drinking these wines on a daily basis is a challenge to the budget. Personally I prefer blind tasting results, of grading wines, to the sighted! When the palate decides the rating, it leaves out the possibility of label reading. So when a wine makes a ‘Top 10’ and there is an average price of R250 a bottle, but one wine comes in at R100…………….for me that is best value. Sighted tasting ratings I do not take much heed to. I prefer to taste myself and decide. So for me blind tasted competitions of varieties is a consumer heaven. Don’t stop!!! I think Jono has a great idea with a dedicated value section. And perhaps to not weigh down or confuse the perception of the quality by awarding an 85 points (which is a great score for a 70 rand wine! ), in the value section there is “recommended” and “highly recommended” then the consumer can be given some guidance on what to buy in a sea of grocery store wines. Maybe a monthly 2-3 recommended value wines with just your impressions and what you liked. That doesn’t really exist in the media landscape anymore. The idea of including more “value” wines is a good one but abandoning scores for value wines would do them a disservice. And what would the cut-off be for not scoring a wine? If this site is going to include scores then all wines should be scored. Apart from providing an additional facet with which to describe a wine, the benefit of being able to compare all wines on the same spectrum is probably the biggest advantage of a scoring system. I would like to think this may entice those that normally do not venture into the value section to try something new, and vice versa for those who steer clear of wines over R100: they may be enticed to spend a little extra to see what a wine that scores 5 more points than their go-to 85 pointer is all about. Bottom line is I think it could potentially help to break down boundaries in consumers’ minds (including my own). I think Duncan puts it very well. When I recently did a series of reports on wines under R100 that I bought from supermarkets fairly at random, the response, including some very useful suggestions, made it clear how much readers of this website (as well as at least some of the regular writers!) want good value recommendations. There’s little need for “expertise” then – we’re not looking for an analysis which indicates how well the wines is like to mature over five or ten years, we’re looking for good drinking with our supper or sitting on our stoep tonight. Let alone is there need for scores, frankly (if there ever is a need for scores). When I and commentors agreed, for example, that Marras Grenache is excellent value at about R80, does anyone really care whether someone scores it 87 or 88 or 89? That recommendation, together with some sort of description, makes it clear that it’s at least worth a try if that’s the style of wine you like – and if it’s not perfect, you haven’t spent a lot of money anyway. I totally agree with your opinion.